We've had beautiful Autumn weather this week. This morning we are just hours away from our town's big parade and the beginning of our Fall Festival. I'm feeling sad that Sweet Hubby had to extend his business trip to Germany an extra day and will miss the main event this morning but happy he will be here later this afternoon and won't miss the whole weekend. 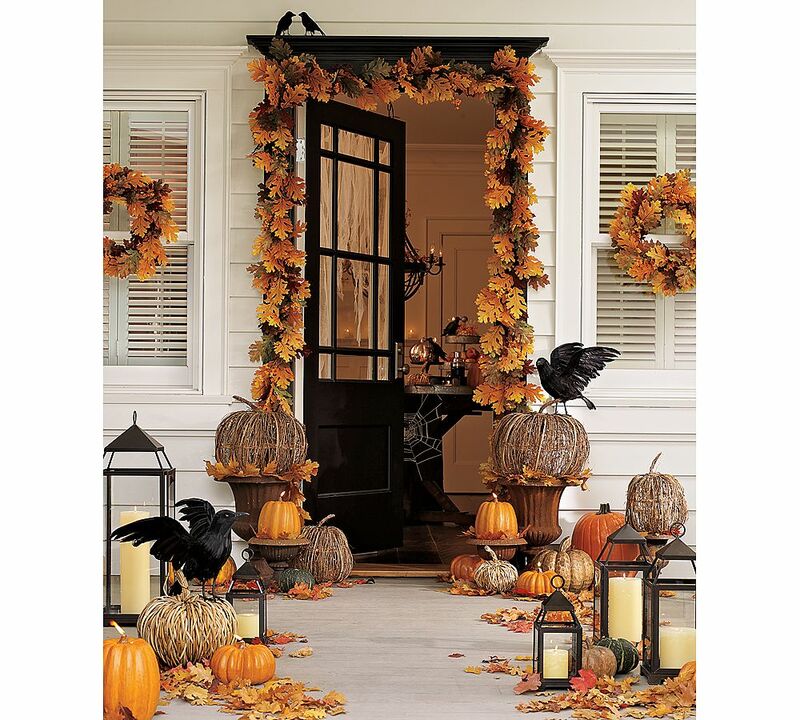 Obviously no Midwestern girl worth her salt could be experiencing Autumnal weather and a Fall parade without her thoughts naturally drifting to seasonal decorating. I find myself drawn to mercury glass, ironstone and natural elements for holiday decorating now. Also, as in every other aspect of my life, I'm feeling less is more. Simple and natural with a dash of flair. That's me in a nutshell. I'm a study in contrasts. It's what makes me, me. I always struggled with knowing how to incorporate Autumn and Halloween together and when and how to do what. I finally figured it out. In September I will focus on Fall elements, adding warmth and texture and keeping it nature inspired then, come October I will edit a bit and add in the Halloween and finally when November arrives, I will take the Halloween back out and count the days until I can decorate for Christmas! Commence with the eye rolling. I'm sure you smarties figured all that out years ago. Sometimes it's the simplest things that escape me. I find a new house gives me an excuse to revamp the holiday decorations a bit, but a forever house gives me an excuse to really edit and just use and buy things I love for the spaces I have now. There is no more keeping stuff because I might need it for the next house. It's time for me to live in the here and now. Maybe there is a life lesson in there for me? Don't worry Jen, you aren't the only one who is just getting decorating figured out! I am also looking more toward natural elements and simplicity, maybe it's just years of dealing with "stuff" but I find simplicity is my mantra lately. Although...darn, I love all the photos you used and some of them are anything but simple! That is what I do. As soon as Labor Day ends I drag it out and commence. I have edited and only use what I love now. Less is more.I don't want my house to look like a shop. PS I adore mercury glass. I love fall and Halloween and all the decorations. I also love the photos you posted, I hope you post some when you are done decorating :-) By the way, I made that Italian meatloaf for some friends a few weeks ago and it was DELICIOUS!!! I'm going to make it for my parents next week. Thanks for the recipe. Jen- I have yet to be in my "forever" house-so I have stuff saved for that time. It's a sickness, I think! I've been fighting fall, JJ. It's true. But seeing these pretty pictures has given me the kick in the pants I need to take my front porch from Summer to Fall. I'm going to buy some mums today! 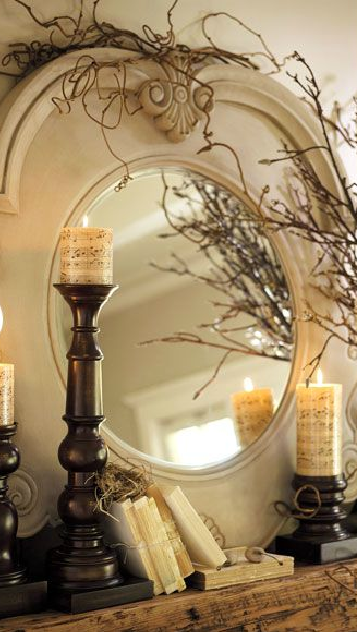 Hard to think of fall decor here in the Pacific Northwest where we have had crazy hot temps for over a week! But I am really ready to add some mums to my outdoor pots and begin cooking soups and stews! I pull out the fallish decorations now and add in Halloween on October 1st just like you're suggesting! I do have a handful of Thanksgiving items that I add in on November 1st. It's nice when some things can do "double duty"! 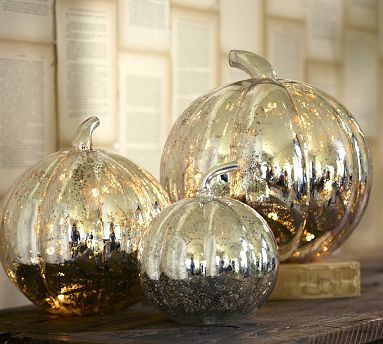 I LOVE those mercury glass pumpkins... I just ordered some from Pottery Barn and cannot wait to get them! Oh Jen...I so agree, the weather is fantastic and has my head spinning over Fall decor! I did a little fun Fall craft this morning and will be sharing it this evening on my blog......I have me Fall decor boxes sitting out, just waiting to find time to transform the house! My husband says it's too early, but I say not! Have fun today and good thoughts for you hubby's safe travel home! I've always loved autumn, in the Midwest. It's lovely to feel the cooler breezes, and see the warm colors tinging the leaves now. Those mercury glass pumpkins are so pretty! 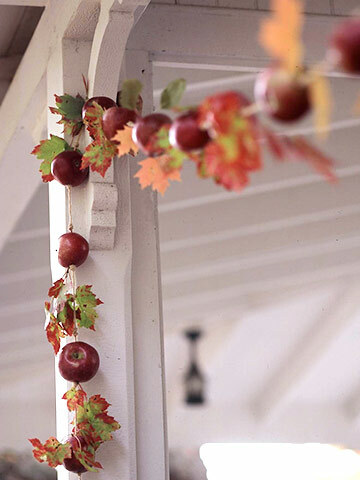 And I really like the apple and leaf garland. Have a wonderful fall weekend with your family! I can't wait to decorate. But I must move next month first! Now I'm packing up, not taking out. What wonderful pics you shared! Those are some great fall decorating ideas. Sounds like you're going to enjoy this weekend with that fun festival and the pretty weather. I love weekends like that. I live in the south and we're just now getting some cooler weather. Finally! a beautiful and wise post, my friend. 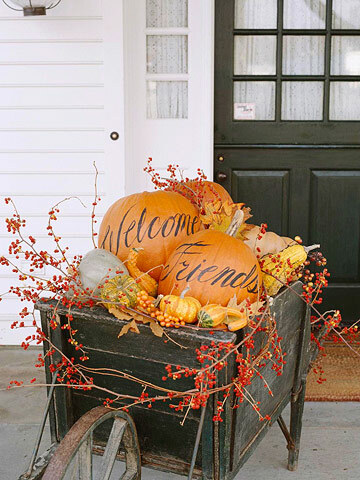 I love the fall pics and your thoughts on seasonal decorating. I am also finding that I want to drag out less bins of "stuff" and use what I have outside or around the house. It is so pretty and stress free! Happy Fall! I love autumn decorating (and autumn!). The photos that you posted are inspiring. I'm the same with the "forever house". Now that we've moved into our new home, we are determined to get rid of the clutter, the stuff that we thought we "might use someday". And, now that we are in a place that we love, we are also determined to only bring in things of quality, to live up to the house. I love all of the photos you posted. Beautiful and so full of fall! How fun your town has a fall parade, I bet the kids love that. I have started my fall decaorating....adding mums instead of my spent petunias....fall mantle. I can't wait to see what you do with your new home! Well done Jen! I just figured that out this year too (and I just turned 50 2 weeks ago)! 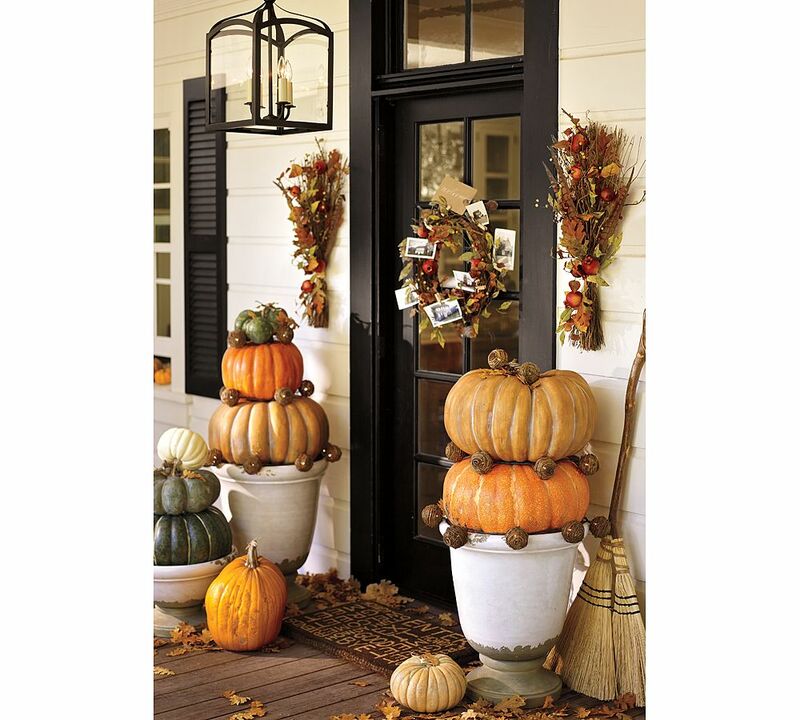 I love to put up Fall decor around the first day of school and can't wait to yank out my withering flowers outdoors and set the Fall stuff out on the front porch. LOVE the cute pics you have of that beautiful porch!!! Love hearing about your life in "The Village"!! Your post is making me stick with my goal of going through my seasonal stuff and edit out what I truly don't love, every year I say I'm going to do it and don't, hopefully this will be the year!! Hope you had fun at the festival!! I can get out my fall decorations, now? YAY! I always just put out a lot of pumpkins and gourds and some halloween stuff (mostly vintage) and then same thing at thanksgiving...I change out the halloween for thanksgiving. And...I'm one of "those" people, who puts up my little tree near the fireplace for Thanksgiving. First of all, I have guests that won't be here for Christmas. Secondly, it is a little four footer that is pre-lit and then I add vintage ornaments and pinecones. Then it is done! Jen - the pics are great and make me want to decorate right now! I struggled a while with the whole "when/what," but I settled into a routine similar to what you described and I can tell you that I love it and all my neighbors love it too. It keeps decorations up from Sept - end of Dec. I'll definitely be looking at these pics for inspiration this year! They are absolutely perfect! What beautiful fall decorations! I'm so jealous that you are having FALL weather. It's still very summery here in Houston. It was 96 degrees at 6:00 p.m. while I was driving home! Maybe if I get my pumpkins and scarecrow out, it will feel like fall. Happy Fall Ya'll! I love all the photos you used and some of them are anything but simple! You have a done a beautiful job! You are one of those decorators whom I wish I were! the inside cloches filled with minature pumpkins lying a bed of spanish moss. Hurricanes with candles surrounded by acorns. I love this time of year.